All players coming from foreign countries over the age of 10 are required, by FIFA, to apply for and receive an International Transfer Certificate before being permitted to play soccer with a soccer club in Canada. The International Transfer Certificate Process is a time-consuming process that can best be understood be adhering to the model below. Memorial University document with address. All the documents must be placed in ONE Computer document. Photographs of documents are not permitted. Note: if the player has played University or College Soccer in Canada, an International Transfer Certificate is still required (if not previously granted one) in order to play soccer under the Canada Soccer Umbrella. Once a player has received an International Transfer Certificate, that player does not have to go through the process again in order to play soccer in Canada. If you are not competing in an event leading to a National Competition, you are free to play soccer!!! I am a Foreign National and I have received my International Transfer Certificate, can I play in the local Premier Youth Leagues, Challenge Trophy, Jubilee Trophy or Eastern Canadian Masters qualifiers and can I play soccer at the Canada Soccer Club National Competitions? How do you receive an exemption from Canada Soccer? 4) Players 9 years of age and under do not require an International Transfer Certificate. However a copy of an official document needs to be provided to prove the fact (e.g. school record, doctor record, etc) that the player entered Canada prior to the age of 10. 5) Players who are in Canada on Study or Student Visas are not eligible to apply. 6) The deadline for submitting the request is July 31st of the current year. 7) Exemptions need to be applied for annually. Players aged 18yrs and over who are not eligible to compete based on the Regulations for National or Regional Championships may apply, through their Provincial Association, to the Canada Soccer Eligibility Panel for an exemption. 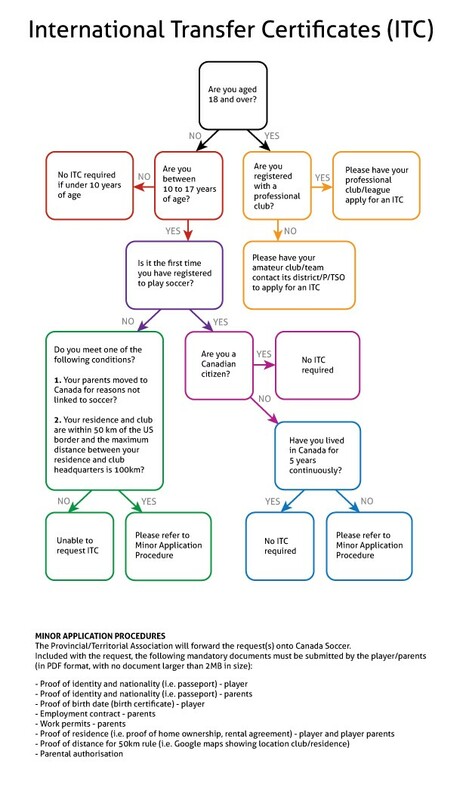 Based on the criteria below, the Canada Soccer Eligibility Panel may grant previously ineligible players the ability to participate in the National or Regional Club Championships. All decisions made by the Canada Soccer Eligibility Panel are final and binding, and not subject to appeal.